Alisa Fleming was born with a milk allergy that followed her into adulthood. As she experimented with the dairy-free lifestyle, Alisa struggled to find online resources and dairy free recipes. She then created her own website, GoDairyFree which has become a popular go-to source for dairy-free tips and suggestions for healthy and delicious dairy-free recipes. Learn about Alisa and her tips on how to add a boost to any smoothie, plus get 2 tasty recipes you can easily at home. Alisa Fleming was born with a classic IgE milk allergy that she did outgrow, but she still tended to keep milk at bay due to lingering symptoms. In adulthood, when she was told that she “must” consume more dairy, she became very ill and ER visits became frequent. Due to her prior milk allergy, her doctor suggested eliminating dairy and her symptoms vanished. No more ER visits! A milk allergy was later confirmed. Today, even though her initial allergy was to milk protein (including casein and whey), she avoids all milk/milk proteins, as well as casein proteins. Initially, when Alisa started her dairy-free lifestyle as an adult, she had a hard time finding resources and dairy-free recipes. Eventually, in 2005, Alisa created the dairy-free lifestyle website GoDairyFree.org, which compiles tips, dairy-free recipes and support for others who are facing a similar journey. Her website, which receives over 3 million unique visitors and over 7 million page views per year, has been expanded to provide gluten free and vegan dairy-free recipes. She has published two bestselling cookbooks, including her latest Go Dairy Free: The Ultimate Cookbook For Milk Allergies, Lactose Intolerance and Casein-Free Living. Here she shares her tips on one of her favorite go-to snacks: smoothies. Not only are they delicious, smoothies are a great way to sneak in nutrition and to help round out any micronutrient deficiencies. Toss in Some Greens: For the veggie timid, this works best with chocolate or dark berry smoothies (like blueberry or blackberry), because the color helps to hide the greens. I toss a handful of baby spinach leaves into my Wild Blue Smoothie recipe, and my husband thinks it’s so cool how the spinach disappears! Spinach is the most neutral in flavor, and baby spinach leaves are very tender, so they blend in well. Just be sure to start with less liquid and then blend in more liquid as needed. If you start with too much liquid, the greens might “spin” rather than fully blending into the smoothie. Pump Up the Protein: Protein powders are made for smoothies, and these days, there are many dairy-free options. Just be sure to use a light hand. I stick to 1 to 2 tablespoons rather than the full serving size, which can overwhelm the taste and texture. I like using Further Food Collagen because the scoop serving size is perfect for adding just the right amount of thickness. You can also add nut or seed butter, which also helps to provide creaminess. Take Stock in Supplements: Most supplements are available in powdered or liquid form, and can easily be added to smoothies. It’s a great option for people who don’t like taking loads of pills. I often add calcium citrate, magnesium citrate, probiotics, and Omega 3 oils before blending. Vitamin C crystals are also fun, and do add tang and tartness, much like lemon, to smoothies. You can find several of my favorite smoothie recipes in my books, Go Dairy Free and Eat Dairy Free. Below are two sample recipes to get you started! This creamy shake recipe emerged when I had leftover canned pumpkin from the holidays. These days I stock up on pumpkin in the winter, so I can enjoy this healthy, cool shake in summer, too. Please note that the stevia in this recipe isn’t purely for adding sweetness. It also helps brighten the spices and other flavors. Put the banana, coconut milk or milk beverage, pumpkin, protein powder, maple syrup, vanilla, pie spice, cinnamon, stevia (if using), and salt in your blender. Blend until smooth, about 1 minute. If the shake is too thick, blend in more lite coconut milk or milk beverage as needed. Pour into a glass to serve immediately. You can add 1 to 2 tablespoons nut or seed butter. This will result in a little more richness and a slight nutty flavor. Recipe adapted from Go Dairy Free: The Guide and Cookbook by Alisa Fleming. Reprinted with permission. In the book you will find a bonus recipe for homemade pumpkin pie spice! This was our daily, go-to smoothie for years. We love the beautiful purple hue and the naturally sweet flavor, and my husband was simply enamored by the fact that you can’t see or taste the spinach. Trust me, not even your green-hating kids will know it’s in there. Put the banana, frozen blueberries, 1/2 cup milk beverage, spinach, seed meal or seeds, collagen, and cinnamon (if using) in your blender. Blend until smooth, about 1 minute. For a thinner smoothie, blend in up to 1/2 cup more milk beverage. For a frostier treat, blend in the ice. Taste test and blend in sweetener, if desired. Pour into 1 or 2 glasses to serve immediately. Recipe adapted from Go Dairy Free: The Guide and Cookbook by Alisa Fleming. Reprinted with permission. In the book you will find a bonus option for a banana-free smoothie! Alisa Fleming is the founder of GoDairyFree.org, Food Editor for Allergic Living magazine, and author of the best-selling dairy-free book, Go Dairy Free: The Guide and Cookbook for Milk Allergies, Lactose Intolerance, and Casein-Free Living, and the new cookbook, Eat Dairy Free: Your Essential Cookbook for Everyday Meals, Snacks, and Sweets. Give all of your smoothies a protein punch with Further Food Collagen Peptides! 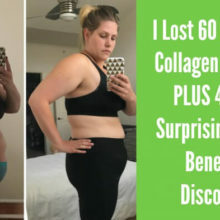 I’m in the same boat Amanda – that’s why I started using it, and I’m loving it! So yummy! Looking forward to trying these! Alisa is such an inspiration when it comes to living with food allergies. She makes it feel possible to eat well and have a fun and fulfilling relationship with food. Thank you for sharing her story. These smoothies look so delicious! They are perfect for as an afternoon snack or even breakfast! Fabulous tips!! Adding in collagen powder has been a big one for me over the last year to help with knee surgery recovery!